I can admit that it is hard to know where to start breaking down my experience with Super Smash Bros. Ultimate. After the triumphant “Everyone is here!” catchphrase had been used to reveal that every character that has ever appeared would be returning to battle it out, the run-up to the hotly-anticipated mascot brawler’s launch culminated in a Nintendo Direct presentation when even more content was thrown on the already overwhelmingly generous pile. With 74 characters – not to mention Piranha Plant as a momentarily baffling but hilariously brilliant (when seen in action) early purchase bonus – and 103 stages to send your competition hurtling off the screen on, Super Smash Bros. Ultimate is bursting at the seams with content that easily makes it Nintendo’s biggest and most daunting brawler so far. But, as well as that, it is also undeniably the best that it has ever been. It’s a long road until the whole roster is available to you, though. There are only eight characters available from the start – a throwback to Super Smash Bros. on Nintendo 64 – with the rest unlocking as you sink time into Super Smash Bros. Ultimate. New characters will appear to challenge you once you have conquered Classic Mode, after brawling it out with friends in the Smash modes or tackling the lengthy Adventure mode, World of Light. Whatever you choose to do, there’s always an unlock ready in wait (and without the unfriendly and obscure criteria used before). It still has its complexities and depth for those that want to explore it on a competitive level, but Super Smash Bros. Ultimate remains accessible to all. You rely on your character’s attacks and special attacks to deal damage to your competition, increasing their damage percentage to the point where it becomes easier to launch them into the skies with a single, wholesome whack. To score a point, that enthusiastic, hard-hitting slam needs to send them flying off the screen. The more damage that they’ve taken, the further that they will be sent into orbit. You can duck, jump and dodge to evade attacks, using a shield to block when necessary. 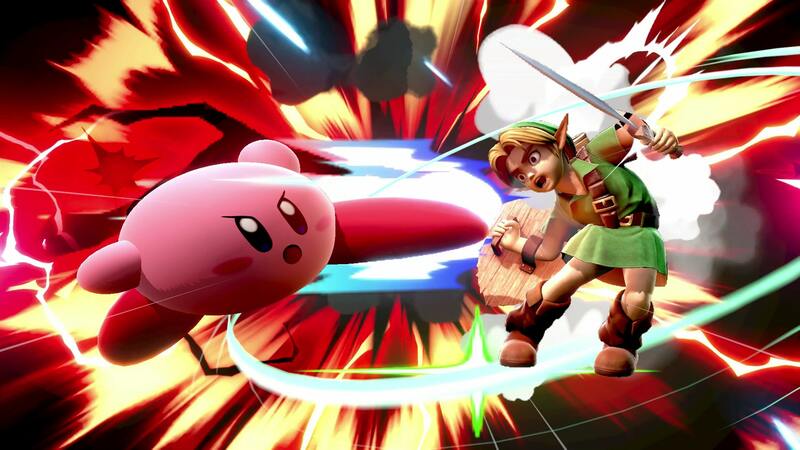 But, once items and the deadly Final Smash moves are thrown into the mix, Super Smash Bros. Ultimate relishes in the ensuing chaos as those playing struggle to keep up with the constant, unrivalled mayhem. There’s a far greater fluidity and responsiveness to movement, making it easier for players of all abilities to react to their opponent and land those important hits. That makes Smash a great place to get started. In this red-coloured section on the main menu, you can choose to battle up to eight players (or computer-controlled characters) in Smash, compete in 5-on-5 (or 3-on-3) tag teams in Squad Strike, or defeat as many as 32 rivals in Tourney. There’s also the chance to compete in Special Smash, where flavoursome twists are introduced like battling with the whole roster in rounds where each character can only be selected once, or Super Sudden Death where everyone starts on 300 percent damage. This (and battling it out online) is undoubtedly where friendly gatherings will spend the bulk of their time, and, with the chance to create your own Time, Stock or Stamina-based rulesets, means that Super Smash Bros. Ultimate is a perfect fit for every occasion. I was disappointed when we learned that a decision was made to shelve Trophies, but, in their place, we have Spirits. These have been pulled from every series imaginable, and, currently, there are a staggering 1,297 Spirits that you can collect. It is in World of Light where they are put to use, a single-player Adventure mode that Nintendo has, whether to downplay expectations or not, been keen to point out is not like Subspace Emissary from Super Smash Bros. Brawl. We have all seen what events happen at the start of the mode, which, for those wondering, took me 36 hours to beat with a 100 percent completion rate. When Galeem uses light to consume the fighters, they lose their bodies and become Spirits. Kirby escapes on a Warp Star and, as the only survivor, must defeat Galeem’s army of puppet fighters to save the world. The whole setup here is that Galeem traps the Spirits that he has captured within puppet fighters and forces them to do his bidding. And, once defeated, you will free the Primary Spirit trapped inside who will then rally to your side, and can be used to boost your character’s attack and defense stats. There’s a Rock, Paper, Scissors system at play, with four types of Primary Spirits – Attack (Red) weak to Shield (Blue), Grab (Green) weak to Attack (Red) and Shield (Blue) weak to Grab (Green) – with the right combination lending you power advantage. There are also Support Spirits that, when equipped, can see you start battles with an item, strengthen your air attack or cancel out negative effects like fog or screen-flipping, as examples. The genius to this mode comes in how Masahiro Sakurai and the development team have worked out how to embody the Spirits with the 74 characters in the roster with gameplay modifiers. The Octorok from The Legend of Zelda is represented as four Diddy Kong that constantly use neutral specials (firing his peanut gun), Twinbellows from Kid Icarus is a Giant Duck Hunt Duo that breathes never-ending fire, while Rock Pikmin are grey-coloured Kirby that use their down-special attack to try and crush you. I won’t spoil any more but there were surprises like this at every turn throughout World of Light and, while I didn’t get the reference for every Spirit that encountered, the level of care, attention to detail and loose authenticity to represent every character is both an astounding and remarkable achievement. Once you have conquered World of Light you will have the chance to start New Game+ where everything that you have unlocked will carry over. But, seeing as the experience remains the same, I didn’t find any reason to bother. It’s a shame that there isn’t a way to easily rechallenge Spirits that you have beaten, but, in some ways, that’s what Spirit Board is for. This is where you will find your best chance to complete the Pokédex-like Spirit List, which was something that motivated my time with the game at least. Spirits rotate in on a time limit, and you can choose to challenge them – rewarded with a chance to zap them into your collection if you win. These battles work in the same way as those in World of Light, but Spirits have rarities – Novice, Advanced, Ace and Legend – that indicate how hard they will be to defeat and capture. It’s become an addiction, for me at least, to unlock them all, and I now have 726 out of the 1297 available. Classic Mode is back and can once again be found under the Games & More section on the menu. It’s far more compelling to beat this time around, thanks to the fact that every character has their own unique string of battles to complete. With five battles, a bonus game where you must outrun a black hole and a climactic boss fight to close, the intensity level that you choose will determine how difficult your opponents will be. This is shown in a chaotic mural, and, while you can only choose to start from 0.0 to 5.0, your success (or mishaps) in each battle will see the intensity level rise over time. The higher it gets, the greater the challenge and the rewards that you will receive. There’s also the chance to hone your skills in a much-improved Training mode, where you can see your opponent’s predicted launch trajectory after pummeling them with an attack. And then there’s Mob Smash, a survival mode that breaks down into Century Smash, All-Star Smash and Cruel Smash. These are a fun distraction, but not something that I naturally gravitated towards playing. And, beyond this, you have the chance to create and test any Mii Fighters, as well as to train the fighter that sleeps within your amiibo. Once an amiibo has been scanned they will become a Figure Player (FP) that, as with Super Smash Bros. for Wii U and Super Smash Bros. for Nintendo 3DS, will fight alongside you and learn from how you play. Your Figure Player can also “inherit” experience and skills from any Spirits that you have unlocked, boosting their level, attack and defense but sacrificing the chosen Spirit. For those that have brawled with the series before, there are no real surprises in Vault. Here you will have the chance to listen to the more than 775 tracks that have been remixed and compiled for Super Smash Bros. Ultimate soundtrack, and create playlists of your favourites. You can also change how frequently specific tracks are heard when playing, meaning that you can battle it out while your favourites are blaring out more often. You can also watch any replays that you have saved and edit them into videos, which is a process that will hopefully help both fans and content creators. And then you can check your records to see what the game’s tracking about your playtime, rewatch movies that you have unlocked, read tips and trivia or spend gold in the Shop to unlock new music, Spirits, Mii outfits and more. There is also a 124-strong Challenge board to complete, with objectives spread across the game’s many modes – Smash, Adventure, Spirit Board, Spirits, Classic Mode and more. These present their own rewards once unlocked whether that be music, Spirits or Mii outfits, and it’s something that I have enjoyed beavering away at. There’s a wealth of content, then, but Super Smash Bros. Ultimate’s core strength lies in the fact that it is an unbeatable multiplayer experience. It looks phenomenal and runs without a hitch, whether you choose to play docked in TV mode or on the move in Handheld mode. I think the only moment where the game ever looked like it was struggling was in an 8-player Smash match with eight Ice Climbers, where, with 16 characters on-screen, the frame rate fell into inconsistency. But, the day-one update has since heroically ironed that out so that we can all live out our dreams. I’m still in disbelief that it runs as flawlessly as it does, especially in Handheld mode.